Drift Brush makes objects on the slide soar, wiggle or swing. A yacht in the ocean, a gull in the sky or a ghost in a haunted mansion – you can animate them using the Drift Brush. 1. Select the Drift Brush from the Add New Animation dialog. 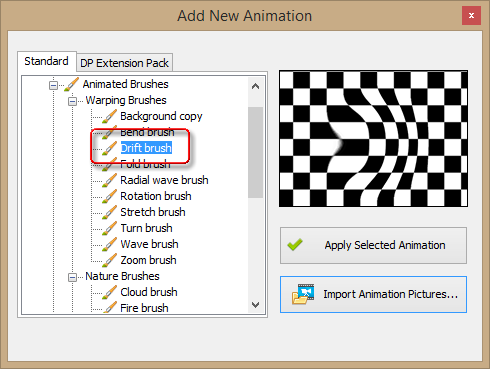 The brush is located under the “Animated Brushes” section in the “Warping Brushes” subsection. 2. Click “Apply Selected Animation”. This adds Drift Brush to the list of Animations on the right. 3. Paint with Drift Brush over the object you want to drift (soaking, waving, jiggling or whatever you feel appropriate to the scene). Turn on the “Highlight effect mask” option to visually control the area of effect. 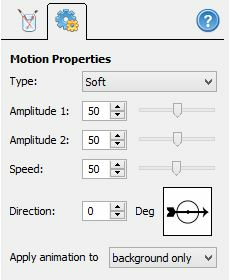 You can control the look of the drift effect by adjusting parameters on the Motion Properties tab. Constant forward - if selected, the object shifts forward for a specified distance. Constant backward - the same for the opposite direction. Sharp - drift is movement back and forth at constant speed, similar to a bouncing ball. Soft - type is for smooth movements: sailing ships, soaring leaves. The animated object slows down near the end of the motion amplitude and moves faster in the middle. Random - the object moves at random speed. Good for representing chaotic elements: sparks, earthquakes, etc. The last two options are one-time shifts and are intended for animating with the Animation Timings dialog, which may come in handy if you plan to use a complex timeline with a lot of events and animations, each synchronized with all others. For simple periodic motion, use the first three options instead. Amplitude 1 and 2 - these parameters specify how far the animated object should move forward and backwards respectively from the original position of the object. Larger and heavier drifting objects tend to have bigger motion amplitudes. A heavy aircraft carrier sails differently from a small canoe, right? Hence, the first one requires bigger values of the amplitude compared to the other. Speed - how fast the animation is. Direction - rotate the arrow with the mouse to specify where the forwardth and the backward should be. While technically there is not much difference between these directions, the forward animation occurs first, then the object moves backwards. This could be crucial in precisely timed animations, so you want to keep this in mind.